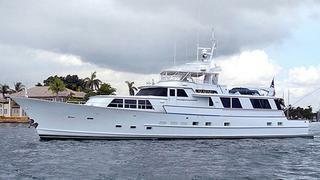 The 28.3 meter motor yacht Seafari is sold with Pam Barlow at Luke Brown Yachts acting for the seller and buyer. Seafari was built in aluminium by US yard Burger Boat with delivery in 1975 and was last refitted in 2007. A true gentleman’s superyacht, she has always been maintained to perfection by a fastidious owner. A Hargrave-designed raised pilothouse yacht, Seafari has always had the best of care and has been continually upgraded. With the same captain for the last six years, she is in excellent overall condition and ready to go cruising at a moment’s notice. Accommodation is for six guests in three cabins consisting of an aft master suite and two twins to port and starboard, all with en suite bathroom facilities. Twin 450hp Caterpillar engines give her a range of 3,224 nautical miles at 10 knots.